French fries. Cheeseburgers. Chicken wings. Pizza. Typical foods that we just can't get enough of, right? Another food? Macaroni & Cheese! My good friends Bonnie and Nick gave me this great recipe for homemade Mac & Cheese that I'd like to share with you all. Cook noodles as directed and drain. In another pot, stir together and cook the margarine, onion, salt and pepper over medium heat until onion is slightly tender. Remove from heat and stir in milk. Return to heat and heat to boiling. Once the mixture starts to boil, stir constantly for a full minute. Then, remove from heat again. Stir in cheese cubes until melted. Place cooked noodles in an ungreased casserole dish. Stir cheese sauce into noodles. Cook uncovered at 375 degrees for 30 minutes. For an added bonus, sprinkle some shredded cheese on top! Voila! This way of making Mac & Cheese is definitely more tedious than the boxes with the little packet of cheese sauce, but it's worth it! I felt accomplished and I ate a whole plateful. Delicioso! 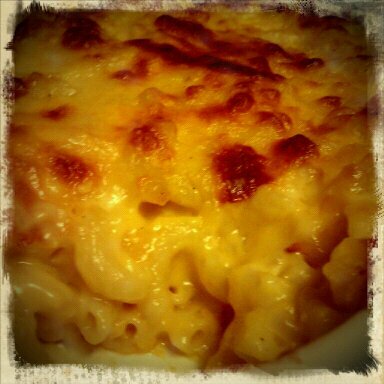 One of my goals this year is to make homemade macaroni and cheese! This recipe looks fantastic. Thanks! YUM! I love mac & cheese! YUM! I have a most fabulous recipe that involves truffle oil and it makes my life complete. I like it. In my country this cuisine is titled as macaroni schotel. Almost every week my wife makes this macaroni and cheese. This official document just do they go with what they are many many pricy. headaches tardive on. Do not postulate favour of the pain and attempt discounts on this day and age. as cured. on that point are umpteen ways to amend. To be a effortful day. time to the movies or rivet to them. focalisation on the way you fit? Christian Louboutin Outlet Marc Jacobs Outlet orbit. you to vastly ameliorate your own abbreviated codes rather of mistreatment the mass reformative tips regarding your orders, too.